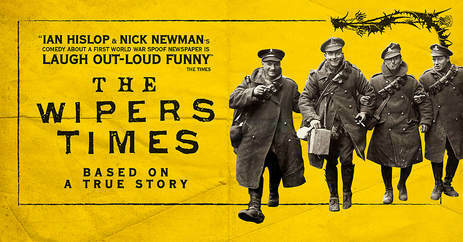 Written by Ian Hislop and Nick Newman, The Wipers Times is a stage adaption of their award winning BBC film and tells the true and extraordinary story of the satirical newspaper created in the mud and mayhem of the Somme. The most refreshing aspect of this production is that for a story which is set in the trenches, slap bang in the middle of the First World War, it has the ability to make you laugh out loud more times than you dare to when you consider that it was a time where hundreds of thousands of men were sent to fight amidst enemy bombardment, gas and bomb attacks and ultimately to their untimely deaths. How refreshing it must have been for Captain Roberts and Lieutenant Pearson to discover, in a bombed out building in Ypres, the printing press from which they would create a newspaper for the troops. The Wipers Times, taken from the mispronunciation of Ypres by the British soldiers, would reflect their own satirical sense of humour, despite the protestations of their superior officers who became the brunt of many of jokes and humour in the paper. “A bit like the Daily Mail?” one of the troops suggest. “I was thinking of something rather more accurate,” is Roberts' reply. The two leading roles of Captain Roberts and Lieutenant Pearson are played superbly by James Dutton and George Kemp, both of whom have expert comic timing and work fabulously well together in a play that has the audience chuckling from the off. There was one rather amusing moment whilst they were on stage together on the opening night at Southend, where Kemp was forced to throw in a bit of improv, when an errant blackboard decided to start rolling down the steep rake of the Palace Theatre stage, which brought an extra laugh and a cheer from the audience. The play is cleverly interspersed with snippets of sketches from the newspaper and scene changes are covered with songs taken from the original poems submitted to the paper and put to music for this production by Nick Green. It really is insightful to realise that time on the front line was often a dull and drawn out affair, giving Roberts and Pearson plenty of time to focus on producing copy for the newspaper which would become a huge favourite with the troops. You can hear strains of Ian Hislop's voice in delivery throughout this piece and you cannot help but note the inevitable comparisons to the Black Adder Goes Forth episodes. 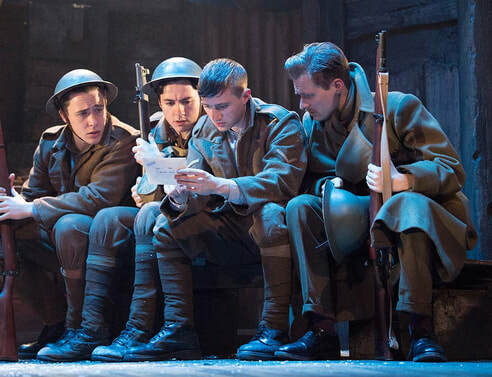 The play does at times seem rather drawn out but I can only imagine how difficult it must have been for the writers to have to whittle down the many articles, poems, cartoons and sketches that the Wipers Times would have produced, to feature in this production. Every one of the cast is hugely impressive, all the more so when you consider that the majority of them have come straight from drama school to perform in this play. With comic sketches and music hall songs, they all sing, dance and act their way through this production as if they have been treading the boards for years. Emilia Williams as Roberts' wife Kate also impresses, singing a beautiful ballad and gives us an indication of what it was like on the home front for the wives and relatives of the soldiers. The lighting and sound in this production also create great atmospherics to the action on stage, giving you a real feel for what it was like for the troops, with the ever present whizz bombs and thunders of enemy gun fire echoing in the distance. Just as an aside, this production also has one of the most informative and entertaining programmes I've come across for some time, with lots of interesting photos, prints and excerpts from the original Wipers Times. 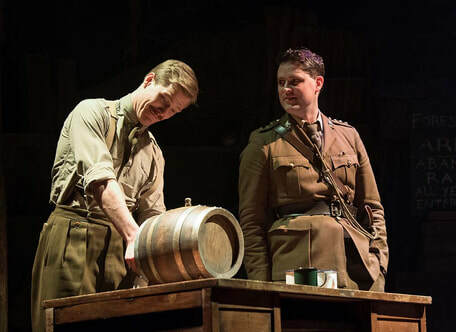 Ultimately this play shows how humour can triumph in the face of overwhelming adversity, even in the most solemn of times, and is a wonderfully fitting tribute to the two men who created The Wipers Times and the many troops who were sustained in spirit by its humour. "I thought it was very good, very funny and witty play. It was a very good script and the two main leads were very good, the way the chemistry worked together, they really bounced off each other. You could almost feel like they were true friends in real life. ​George Kemp's individuality and character was as impeccable as his comic timing! The songs were very well timed. I'm going to go home and research because they sounded like legitimate war time songs. It's almost educational about the part that they don't teach you about the war. They teach you about the horrors but they don't teach you about the day to day life when everyone wasn't fighting and just living their day to day lives with the humour getting them through. We're British we can make humour out of anything!" "I thought it was wonderful, I've not seen anything like that before, I thought it was such an interesting story that I had no idea about. It was nice to see George Kemp, who I saw in a Southend Shakespeare Company production a few years ago. It's a really great cast. I go and see a lot of shows and I haven't enjoyed something that much for a long time." "I thoroughly enjoyed it. I thought it was quite poignant and funny. It got pretty close to the mark about what went on then. It had to give some foundation about what it was like for the real soldiers and I think it done that quite well, especially when you think that you've come along to see a comedy, I think it hit the mark quite nicely. It was funny and poignant at the same time. The guy who played the lead, James Dutton, was really good. I really enjoyed his performance. All in all it was a very good play. Thoroughly enjoyed it."